Rainbow Mountain is located on the west side of Whistler with its base nestled between the shores of Green Lake and Alta Lake. Each morning the sun coats Rainbow Mountain from head to toe before warming the valley. It’s glaciated peaks and deep valleys shine with the early light against the rest of the dark mountains waiting for their turn, an undeniable attraction with rugged peaks and rolling ridges begging to be explored. A series of trails on Rainbow Mountain, both new and old can take you to nearly any aspect of this mountain. Each zone has its own set of unique views, destinations and trails to get you there. Some trails are beginning to link these previously separate zones together and take you into new places altogether. 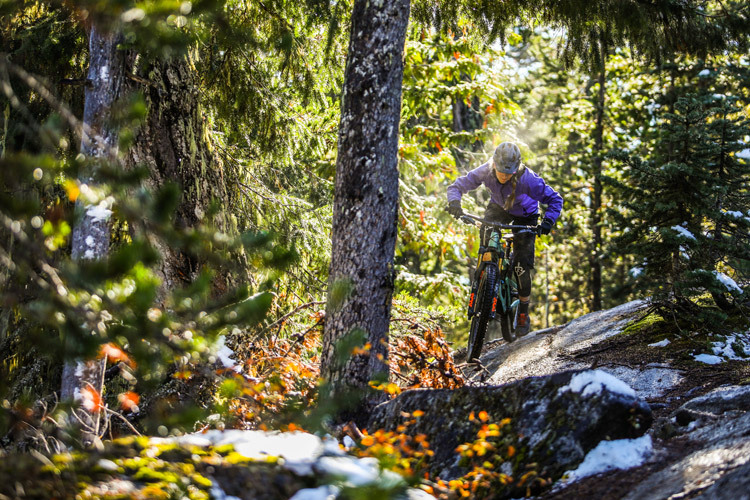 We’re going to break down the various trail names and systems to get you out there exploring this backyard beauty! Trails also connect to the Sproatt trails including destinations such as Hanging Lake, Madeley Lake and Sproatt Mountain. This trail is the newest of the routes on Rainbow Mountain. 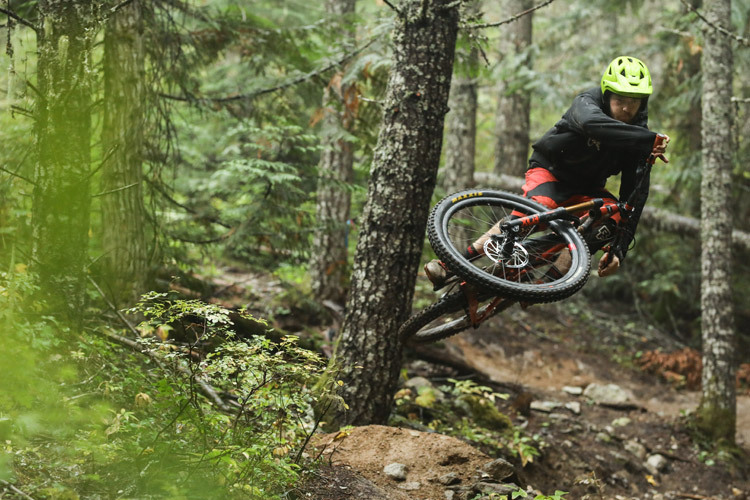 The trail formally opened in 2014 thanks to efforts made by the RMOW, WORCA and local community members notably including the Escape Route store employees (we originally covered it in the Insider here). 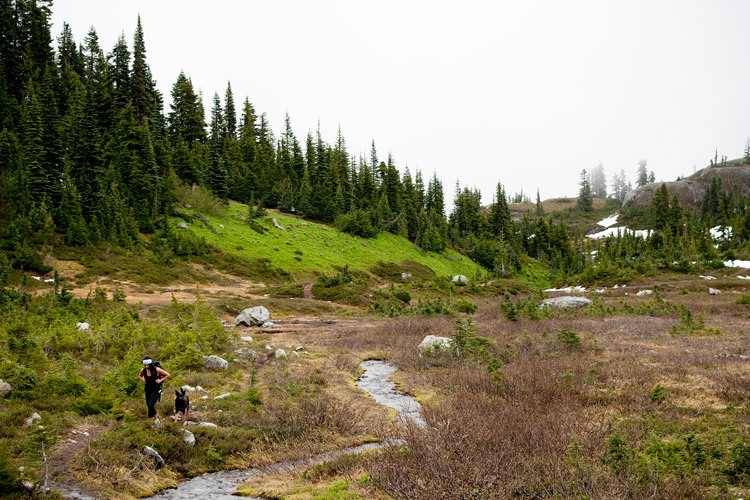 With trailheads you can walk, bus, taxi or bike to in Whistler it’s an alpine trail with easy accessibility, a rarity that should be taken advantage of! The sight of glacial ice pouring into the perfectly blue Iceberg Lake with a hanging glacier above and a valley view to your back is most definitely worth the effort. With multiple routes to get to Iceberg Lake, we’ve broken it down to match the map. Read on for a couple of recommended routes then determine how you’d like to piece together your journey! Recommended Route: Screaming Cat Lake to Iceberg Lake. This loop lets you see it all and with both trailheads in the community of Alpine you’re a short walk to your car or bus but you are always covering new ground with the biggest ascent out of the way in the first section of the trail. Please note that right and lefts are in order of ascending to Screaming Cat Lake and descending Iceberg Lake. If you do the trail in reverse these right and lefts will not match your experience. The trailhead is found at the end of Mountain View Drive in the community of Alpine. Right away you’ll see a wide worn path without much signage, this is the mellowest route and designated trail. 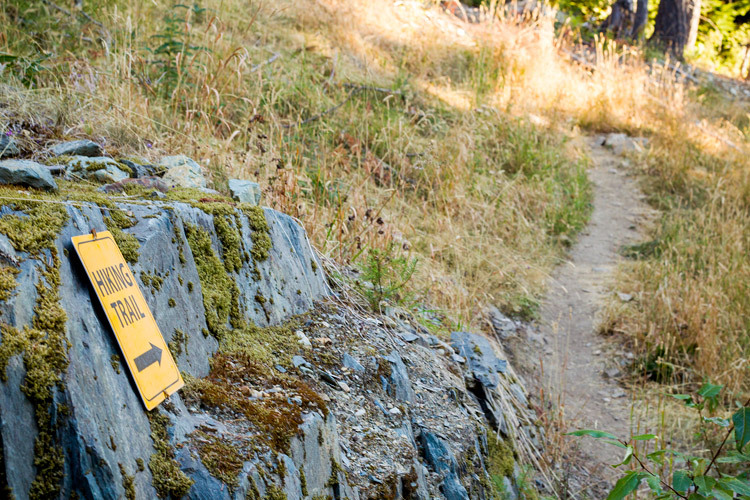 You may be tempted by a trail to the lookers left of where you’ve parked that goes straight up hill – if you want to start your gains, hop on and ascend, but be cautious as this is a bike trail, you’ll need to listen and yield to bikers coming down. No matter which up you initially take, it is short lived as you encounter a small BC Hydro project, here the trail to take is clearly marked “Hiking,” this is where you’ll want to go and is marked on the map as 19 Mile Creek East. A marked look out on this section of the trail is worth the quick detour and requires minimal effort. It’s especially gorgeous in the morning as the sun beams through the valley with views from Black Tusk to the back of Mount Currie. Carrying on, you’ll hit another intersection shortly after, left will keep you on the 19 Mile Creek East route and lead to Iceberg Lake by passing Screaming Cat Lake. 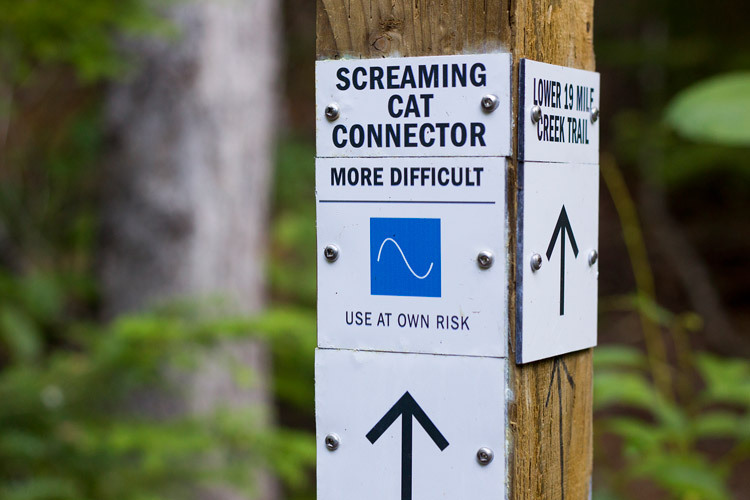 The recommended route is to take the right at this intersection which will put you on the Screaming Cat Lake Connector, it is steep, fast and entertaining. Another junction labelled Flank Trail North waits for you, again left takes you to Iceberg with out Screaming Cat Lake and right takes you to Screaming Cat Lake. 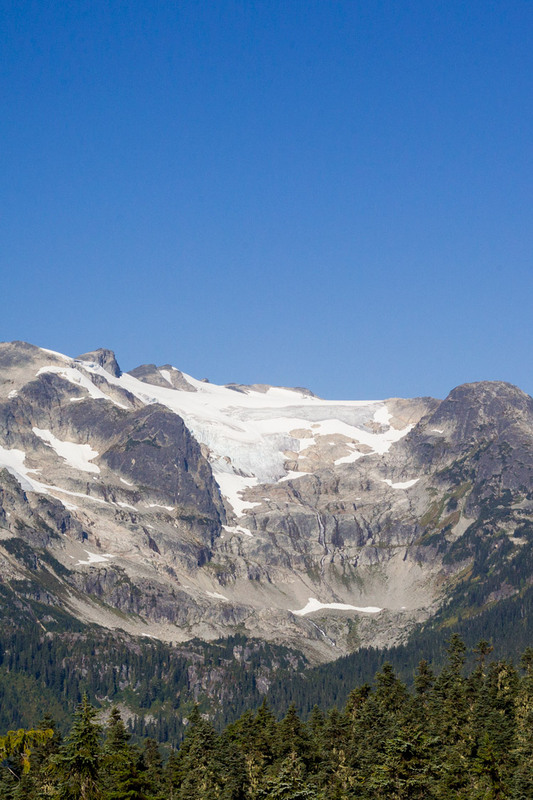 Now you stay on this section of trail for a while with another marked look out to the right offering 360 degree views of the Rainbow Glacier, Soo Valley and Sea to Sky valley. Back on the trail, you’ll cruise through this gentle section with ease, most of your big gains are over, weehoo! One last intersection before reaching Screaming Cat Lake, for the first time, stay to the left as the right option leads down the Soo Valley to a FSR away from Rainbow Mountain. Welcome to Screaming Cat Lake! 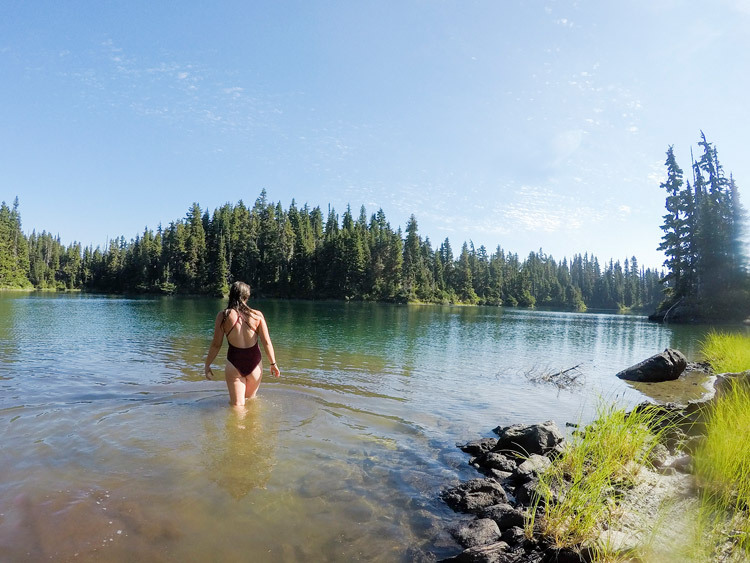 This sub alpine lake is a perfect place for a swim and snack. Carrying on, you’ll see its neighbour, Screaming Kitten Lake. You’ll be gaining and loosing a few ridges as the Screaming Cat Lake Trail flawlessly turns into the Skywalk North trail. Skywalk North will deliver you right to Iceberg Lake and show it off from the alpine ridge above before reaching its shores. 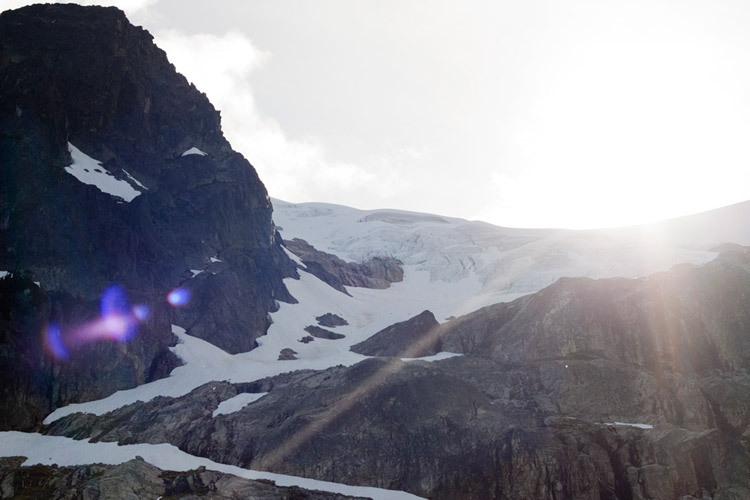 Enjoy the well earned glacier views and hydrate. Marmots love this area, keep an ear out for their whistle. To descend there are two initial options, both start by going right over shelf the lake sits on, down towards the alpine meadow below. It looks steeper than it is, but use caution as some of the rocks are a bit loose, following the cairns will keep you on the best route. Soon after crossing a bridge at the edge of the meadow, there will be an option to continue down on Upper 19 Mile Creek (left) or take the Skywalk South (right). 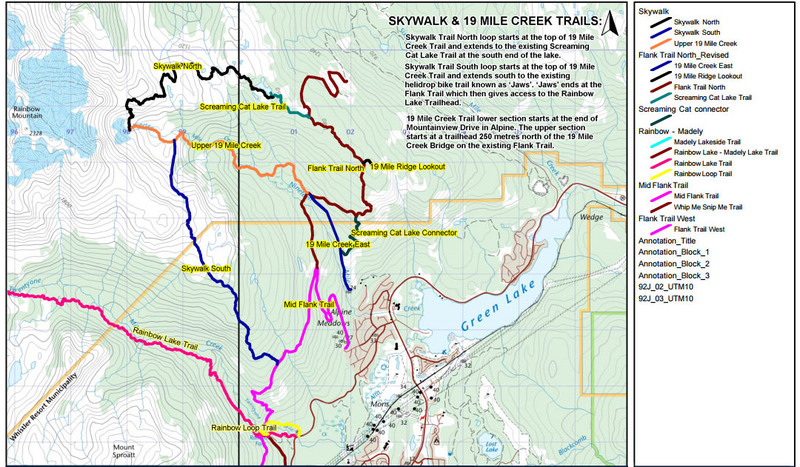 Skywalk South will take you down towards the Rainbow Loop Trail showing off Rainbow Falls after meeting up with the Mid Flank Trail, but also take you out of the neighbourhood of Alpine. We recommend staying on Upper 19 Mile Creek. This trail passes two unnamed waterfalls on route, both impressive in height and power. Walk the boardwalks through an old growth forest and eventually hit an intersection with 3 options. To avoid hitting the same trail twice take the trail on the far right labelled Whip Me Snip Me, again this is a multi-use trail so watch for bikers. Eventually you will meet with the Mid Flank Trail which widens out considerably. You’ll cross a bridge and continue down to the bottom of Alpine Way in the community of Alpine. If you’d rather end up where you started, take the middle route at the three way intersection marked 19 Mile Creek straight down to Mountain View Drive – the end of this trail was your very initial up! As mentioned you can do a loop starting from Rainbow Lake trailhead by heading east on the Rainbow Loop trail, then continue north east on the Mid-Flank Trail to the Skywalk South trail. This will land you at the end of Upper 19 Mile Creek just under Iceberg Lake. 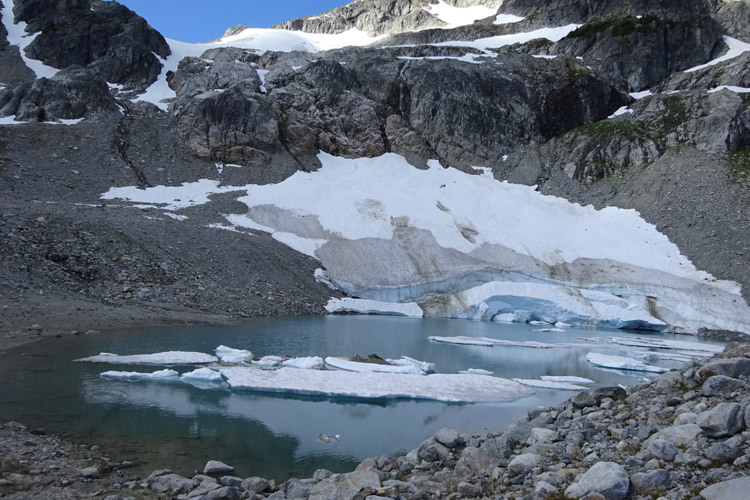 Take this route as a loop to Screaming Cat Lake, or simply down the Upper 19 Mile Creek trail after seeing Iceberg Lake to 19 Mile Creek East and then return via Mid Flank and Rainbow Loop Trail. Rainbow Lake Trail starts off of on Alta Lake Road and is marked clearly as an in and out trail right to Rainbow Lake. Please note that Rainbow Lake is in the watershed so no swimming or dogs are permitted in the area. 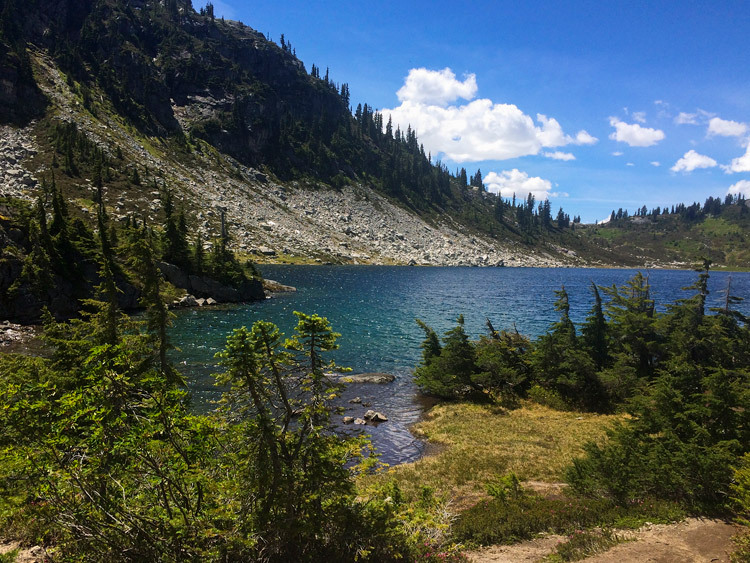 Rainbow Lake as a destination offers the potential to continue on to beautiful and rarely visited Beverly Lake where camping is available. There is also a route to summit Rainbow Mountain from this side. It is not marked clearly, and does not cross glaciers but does require mountaineering experience. Curious but not sure you have the skills? 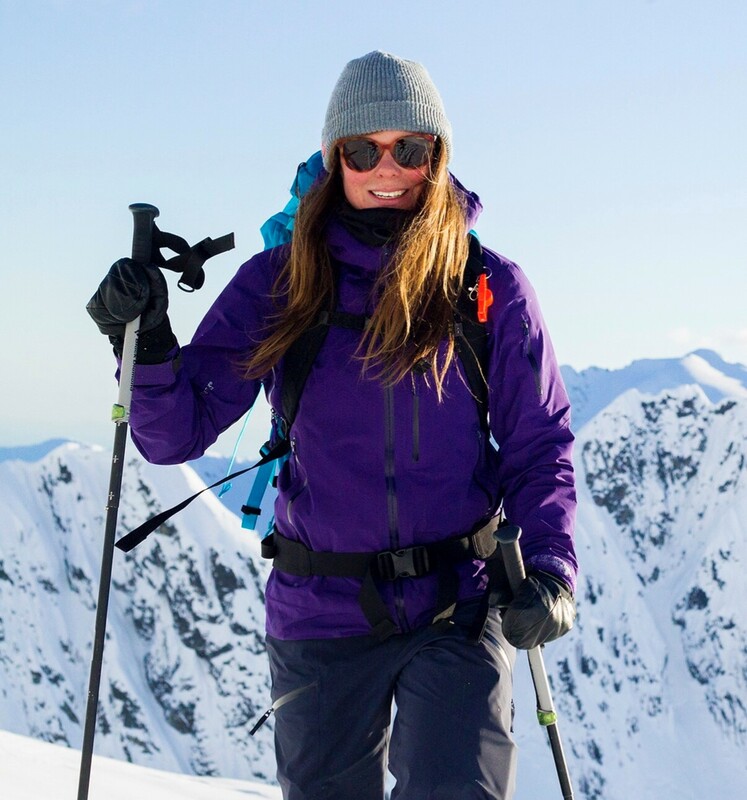 Go with a guide from Mountain Skills Academy. 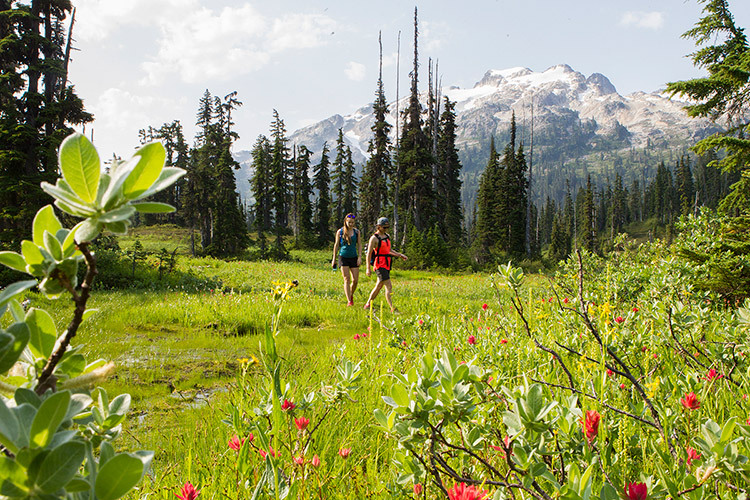 You can also reach Rainbow Lake by starting in the neighbouring Callaghan Valley. Park near Madeley Lake and watch for the trail head just south of the lake on the west side of the road. 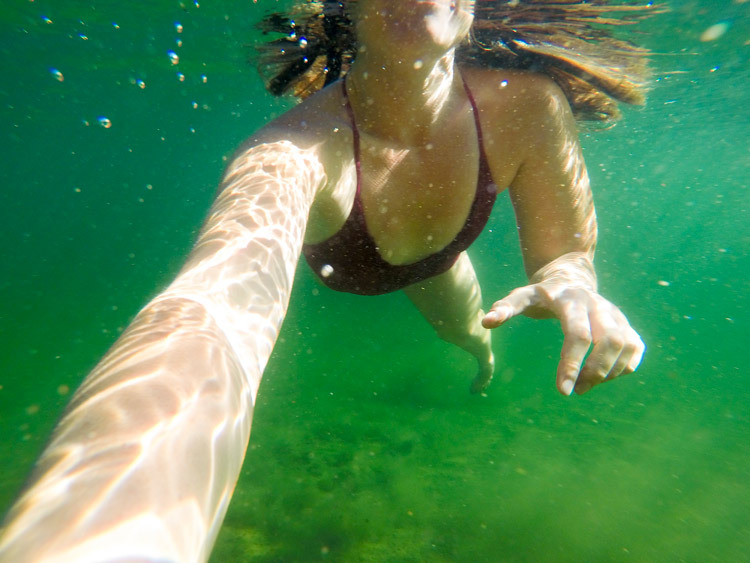 This route allows you to visit Hanging Lake, Sproatt Mountain, Gin and Tonic Lakes or head straight to Rainbow Lake. Please note that many of the trails in this network are not very well marked or worn. Read “know before you go” below for tips on navigating! 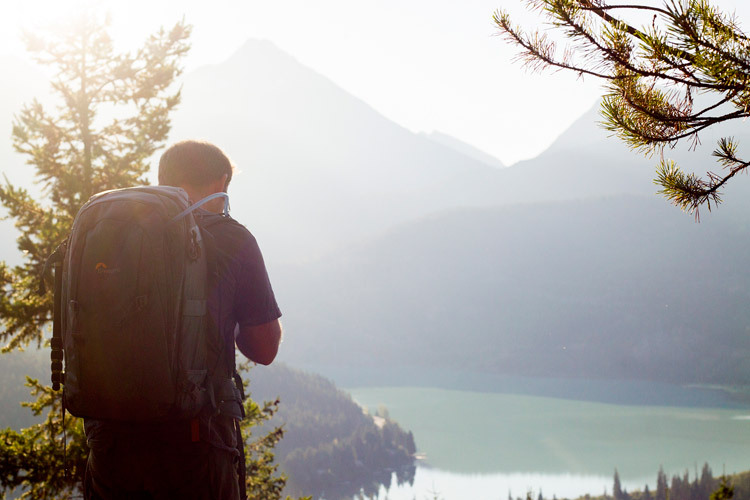 The elevation gain is substantial so supportive hiking boots are ideal. 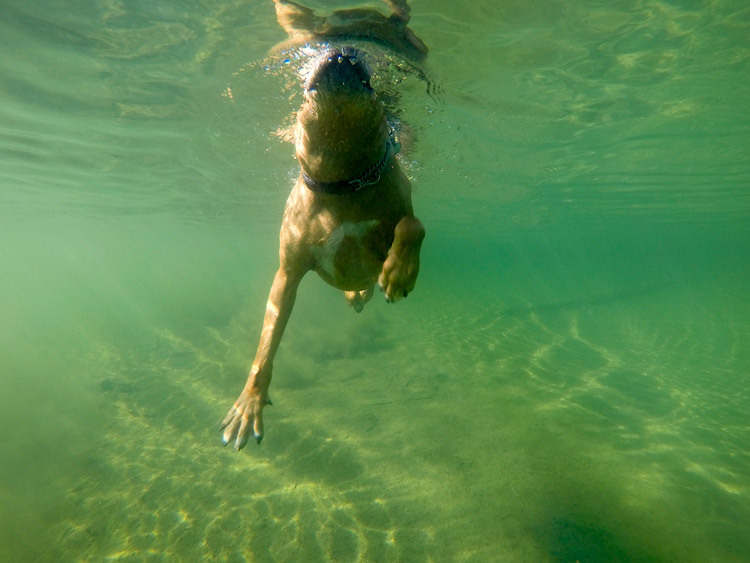 Rainbow Lake is in the community watershed so it’s a no-go-zone for dogs and swimming, if these are most important hit another trail when selecting your route as the opposite side (Iceberg Lake and Screaming Cat Lake) is dog friendly and swimming in Screaming Cat Lake is a treat! Leave no Trace – Be careful to keep on eye on wrappers on a windy day and make sure they make it out of the backcountry. Same goes for food scraps, if it came in, take it out. 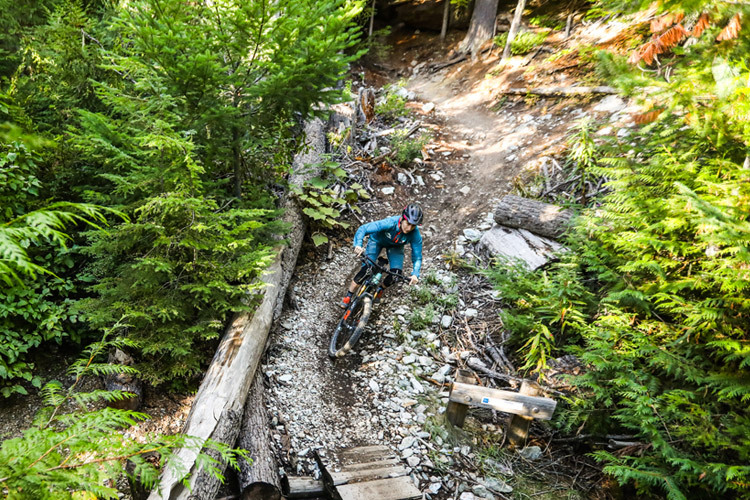 Some of the trails lower down on Rainbow Mountain are very bike-able, make it a multisport by biking the initial approach and final decent of your hike. 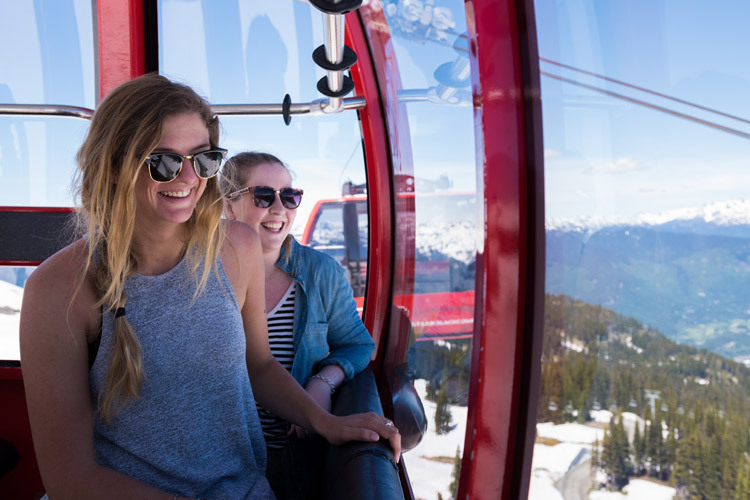 While you might be able to see the town of Whistler from the peaks, the logistics of getting help on the trail aren’t so easy – so prepare accordingly. Before heading out let some one know where you are going and when you expect to be back. Even better, do that plus bring a fully charged phone, or better yet a sat phone as there are more places without service than with despite the proximity. Hiking with one other person is good, hiking with 3 friends is even better! 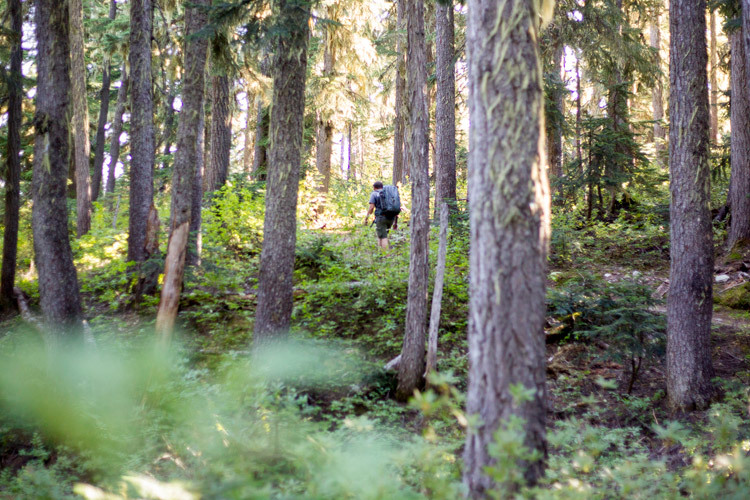 The magic number of 4 scares aware bears and other animals, it also can distribute group gear like a satellite phone, first aid kit, bivvy, and so on in a way that everyone has more gear available and a lighter pack. Bring a map! Clarke Geomatics makes an excellent map of the Westside of Rainbow Mountain, but not the East approaches. It can be purchased at Escape Route in the Whistler Village. You can also download the Canada Topos Map App on your iphone, and then select the area of Rainbow Mountain to get in-depth topographical maps that will give you elevation, direction and GPS coordinates even with out service, but the map must be downloaded prior to loosing reception. In the early spring it’s tricky to tell what is glacier and what is just snow, stick to the worn paths and look for cairns marking the way to avoid weak snow bridges on the ice. Glacier travel is completely avoidable on Rainbow Mountain, and it is highly recommend that you skip it unless you have significant experience in the mountains, as conditions can change rapidly and there are serious risks involved for the unprepared. Don’t forget food, water and clothing for changing weather. 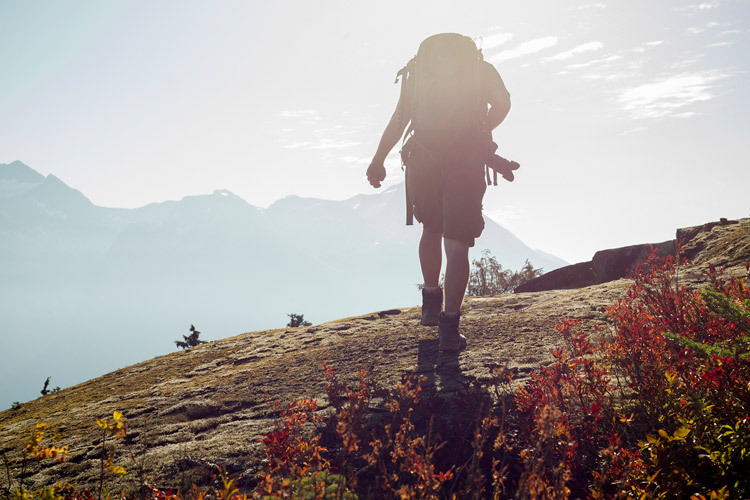 For more information on hiking in Whistler, check out our collection of hiking posts from the Whistler Insider. 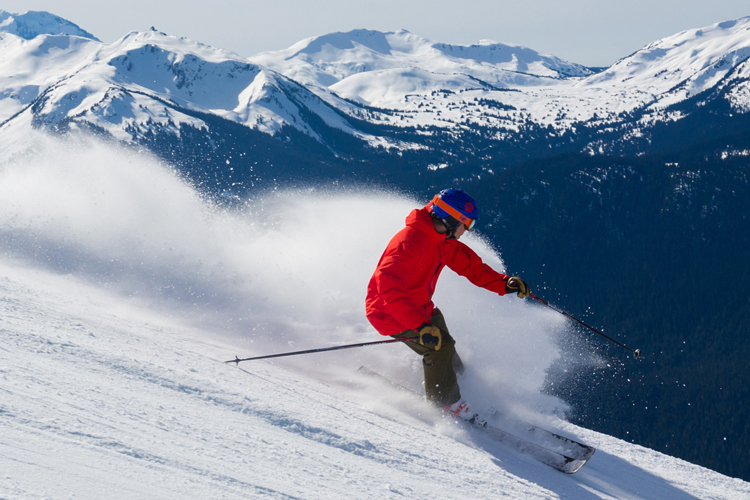 The Whistler Visitor Centre is the place to go when you arrive for up-to-date trail conditions, and for all other Whistler information Whistler.com is your go-to site.